After a 3rd place finish at State last year, the Waukee girls' head coach Abby Schmitz has some exciting goals for the team this year. Each week the Warriors have shown big improvements in fitness, but the Fort Dodge replacement meet in Ankeny was a huge jump for team. You're seeing that right... Waukee went 1, 3, 6, 8, 9, 13, and 14 with a team average of 18:57 and a split of less than a minute. They scored just 27 points. Though Schmitz claimed the course may have been a bit short, if we add an estimated 18 seconds to each athlete's time (as recommended by the meet officials), they still had their top 5 under the 19:40 mark. When asked about these great improvements, Schmitz discussed some new training techniques that appear to be paying off for the Warriors. One of their biggest changes in training is the use of heart rate training. "During the week, we usually have at least 2 days where we go on endurance runs for about 45-55 minutes, depending on the week. During these runs, our goal is to stay in an aerobic heart rate zone." She went on to explain their harder days... "One day of the week we dedicate to VO2 work, where girls will run at different paces during a 3 minute interval. Another day is spent on developing absolute speed where athletes with work on mechanics and form while sprinting for a short distance. Some workouts are completed on grass and others on hard surfaces. We try and keep a variety of training surfaces in our plan." She explained. Though heart rate training and time-based running is not a new concept to the running world, it is a concept that many high school teams have overlooked due to the difficulty of doing so properly for everyone. The Waukee team invested in a large number of heart rate monitors so their athletes would have the ability to truly utilize the training successfully, which has clearly paid off. Their focus on heart rate began over the summer, as explained by Schmitz. "Our team meets Monday-Friday during the summer for about an hour and a half each morning. We try and lift 2-3 days a week with our Warrior Strength program in Waukee before we run. Then we go on endurance runs where our focus is to stay in our heart rate zone after the lifting sessions." She also knows that meeting 5 days a week has more than just fitness benefits for her athletes. "Meeting each day helps the girls bond and run together as a team. They also hold each other accountable for making their mileage goals by meeting as a team." Now that the racing season is in full swing and we are looking towards the Championship season, the Warriors have incorporated some other types of training that have taken them to the next level going into these faster races. "This year we have been trying to focus more on speed. We have increased the amount of practices that we spend toward developing absolute speed. I think now that the weather is starting to cool, and girls are running on flatter courses, they are able to utilize these speed practices we have been working on. Through speed development our running form, including how we hold our arms, has really improved." 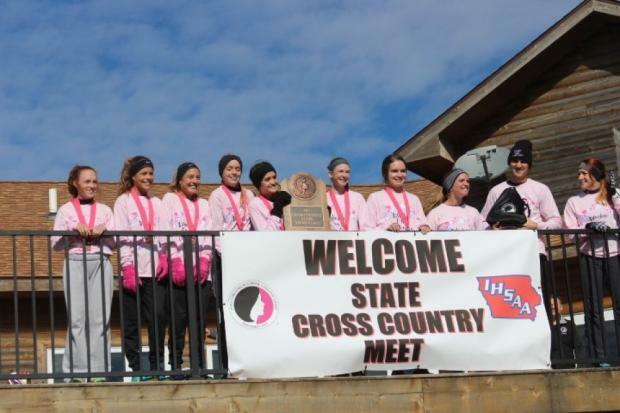 With the mix of heart rate training, endurance runs, and speed development, the Warriors are starting to run down this year's favorite, the returning State Champs the Johnston Dragons. Though they both raced last night, it is impossible to compare since they were on different courses. Just looking at the MileSplit Rankings (which use each athlete's season PR), the Waukee girls have run much faster times this season than the Dragons and definitely have a shot at dethroning them. But Schmitz isn't focused on winning, she is more focused on implementing race strategies- though another podium finish is certainly in the back of their minds. "We have our goals set high and hope to finish in the top 3. We like to focus on the things we can control, so right now we are working on our start, running in a pack, mental toughness strategies, and our pace in the middle mile. These girls will be ready." She is proud of the team culture they have developed and how well her athletes have responded to success thus far, and knows a strong team culture is a big part of their improvement. "I truly believe one of the reasons while the girls are so successful is because they are good friends on and off of the course. They are truly happy for the success each individual runner has on the team." And that culture has carried through to their races. "They support each other and instead of focusing on trying to "beat" another teammate, they encourage this teammate to run alongside them and move together." That kind of team culture can most definitely breed a great deal of success. With so much success after being the head coach for just the past few years, Schmitz had this advice for other coaches. "We try to create a team culture that is accepting of all talent levels and personalities. We try and create a training atmosphere where girls can learn and grow. Our team is a place where you can make mistakes and fail, and then learn how come back and improve. We goal set often throughout the season and check in with girls each meet to see how those goals are going. We want girls to know, no matter their talent level, that their goals are important and they are a valuable member of our team. We believe if you can create these foundational pieces to your program, you will find success." And success they have found. So what do you think? Will the Waukee Warriors take down the Johnston Dragons in 3 weeks?